Would I knit it again? Most definitely! The yarn is very soft and squooshy BFL. It doesn't hurt that "naiad" is Greek for "fresh-water nymph." Yep, I'm a sucker for anything classical. In a similarly unoriginal vein, I'm copying Leslie from A Friend to Knit with today. 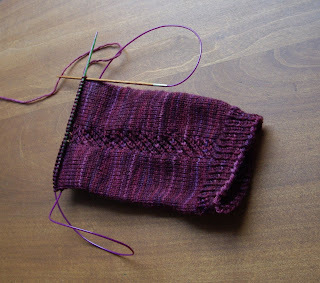 I cast on for her latest pattern, a pair of Toasty fingerless mitts. Armed with Frog Tree merino and a mug of Darjeeling, what else could a girl want on a cool, crisp autumn afternoon? Oh yes, pumpkin cookies, fresh from the oven. 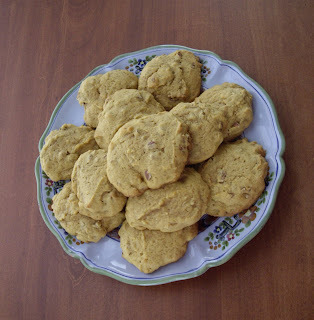 I used the Pumpkin Drop Cookie recipe (also from A Friend to Knit with). Despite having oodles of butter, they're light and fluffy, almost cake-like. I added chopped pecans, as well as a sprinkling of cardamom (that's my Nordic blood coming through) and nutmeg (the German side, this time). I can never add just cinnamon to a recipe! The last pan also has chocolate chips. In between sneezy stretches of working on my Liesl sweater, I'm also chugging along on holiday gifts. Yarnville is threatening to reach maximum capacity, so holiday knitting is really a gift for me, too -- the gift of space. 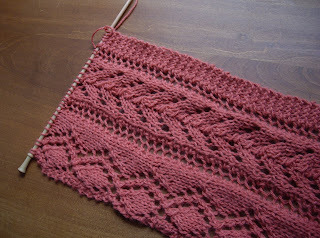 Here's a start on a Juliet scarf from Louisa Harding's Knitting Little Luxuries (also available as a free download from the Interweave website). There's something very captivating about this pattern -- it's hard to put down. It's more like a lace sampler. You don't get tired of doing pattern repeats, since you're moving on to a new stitch pattern. I was tempted to use my new light blue Fairy Hare, but since I actually have enough yardage on that for a shoulder shawl, I resisted and dug out some AslanTrends Invernal (also an angora blend) that I scored for 75% off at a Loopy Yarns sale. Strangely enough, a friend at knitting night was working on a gorgeous sweater in a different color of the same yarn, and it had a completely different, even softer texture. I'm so pleased with how my Manos Mini Shawl turned out. It just needs to be washed and blocked! 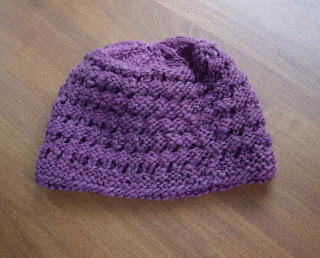 I highly recommend the pattern -- easy to follow and perfect for movie/football knitting. The Faroese shape makes it fit very well despite not being very long. These dark autumn mornings mean that the ladies are often on the hunt after they get up [they sleep in Cat Prison AKA my study]. 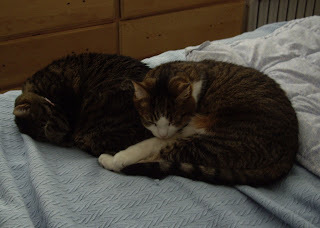 They tear around the apt, pouncing on each other, shadows, and my feet as I try to get a little more sleep. Then once the sun is up, they forget their quarrels, and snuggle up together for some much-needed shuteye. Jody's version inspired me to cast on using the long-stashed Debbie Bliss Alpaca Silk. 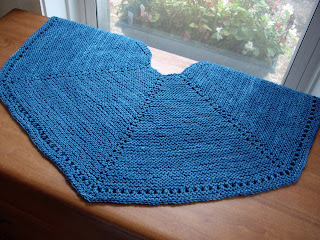 I had purchased it many moons ago for Ysolda's old Cloud bolero pattern -- when would I knit with it otherwise? 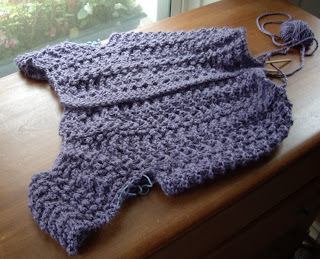 I plan to make another Liesl with longer sleeves and perhaps no garter ridges using my lovely new Briar Rose yarn, too. So, a few thoughts on DB Alpaca Silk -- it's so soft and super slippery to knit. Using metal needles with it would be grounds for knitter's suicide watch. 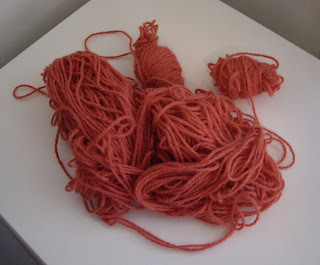 The yarn is a loosely spun 2-ply, so it is a bit fragile, and doubtless it will pill like mad. The balls are annoyingly skimpy on the yardage -- something like 72 yds/ball. It also makes me sneeze. :-( But it's very pretty, and oh-so-soft! So my overall opinion is mixed. 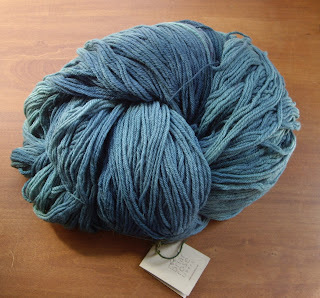 For a project requiring soft, heavy worsted-weight yarn, I'd probably turn to Malabrigo instead. 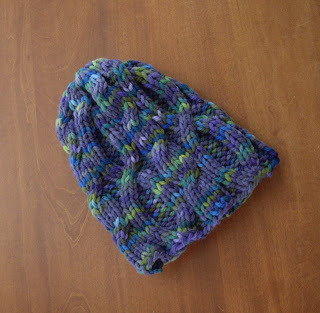 Here's a quick hat I knit up while watching football. Can you believe it's the first time I used regular Manos? I like the rustic texture and saturated color, but it's no Mmmmmmalabrigo. 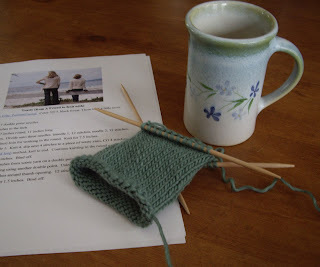 Notes: Since I'm such a loose knitter, I went down to size 7 needles. My row gauge was a bit off, so I knit 6 total repeats of the main pattern rather than 5. Next time I'd do 7 repeats. It's kind of a funky vintage look, almost crochet-like for the main pattern. I'll try to get a modeled shot, since it's a cute, unusual shape. And Only to Deceive, by Tasha Alexander -- a light "historical" read, kind of a dud. Not recommended. Stardust -- based on the Neil Gaiman book. Nothing groundbreaking, but charming and sweet, in the same vein as The Princess Bride. Speaking of The Princess Bride, I'm disappointed to have missed out on The Plucky Knitter's latest Princess Bride-inspired shop update. Oh well, I probably have enough yarn already. Yep, I'm a child of the 1970s, just as predicted. What really surprised me was that my grandmother's name -- Elfrieda -- actually popped up! It was popular around the turn of the century. She always hated her name and preferred to go by a nickname, and I've never met any other Elfriedas. This may be a handy tool for soon-to-be parents (like you, Melissa!) looking for names. Just sayin'! My Manos Mini Shawl is off the needles, ready for washing and blocking. We'll see how long I procrastinate on that one! My second Silk Garden Feather and Fan Comfort Shawl is all washed and blocked, at long last. 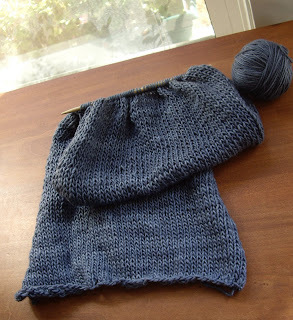 It's amazing how quickly the knitting went -- under a week -- and how much I dawdle at giving projects the final touches. The colors didn't knit up exactly as I had envisioned, but that's part of Noro's mystique. You never really know what Mr. Noro has in store for you! Notes: 5 skeins resulted in a very useful size. I'm happy with the results, even if the colors aren't exactly what I imagined! Next time I would bind off a bit more loosely and be more careful about blocking the nicely curved edges. While in Minnesota over the weekend, I met up with Chris of Stumbling over Chaos fame! We whiled away part of a rainy afternoon knitting, chatting, and drinking delicious Peace coffee. 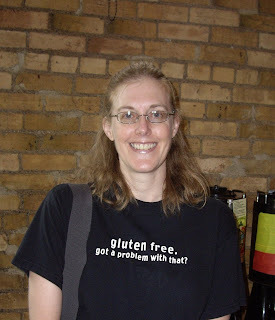 She had all sorts of excellent recommendations for independent bookstores in Minneapolis, and it was great to meet in person. - Fall truly is here. Some of the trees in WI are sporting beautiful foliage, and there are all sorts of wildflowers and shrubbery I'd never noticed before. - It's much easier not to speed when you're driving a friend's 14-year old Mercury Mystique that has its "check engine" light flash on every time you go up and down a hill or you hit 70. Terror! 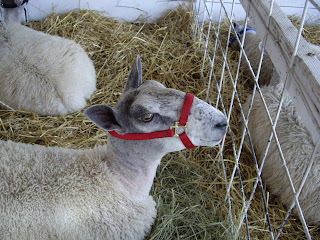 I had a marvelous time, petting sheep and angora rabbits, and buying far more yarn that I actually need. I even watched an angora rabbit get a thorough shearing by Janice Becker of Kimmet Croft! It was one of the cutest things ever. I was so dazzled I didn't even think to get out my camera. Briar Rose is one of my favorite vendors, and I picked up a big skein of Charity to knit a Liesl for myself. I know, I had swatched with the DB Alpaca Silk in my stash, but I'm worried about stretchiness and itchiness. 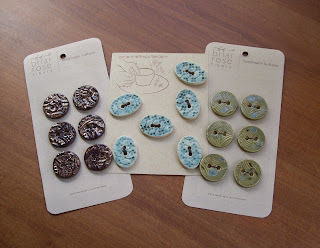 And I found the perfect buttons! The blue-green ones in the middle are for Liesl, the brown ones on the left are for my cranberry FLS (still sleeve-less), and I just couldn't resist the green ones on the right. Easy and delicious! 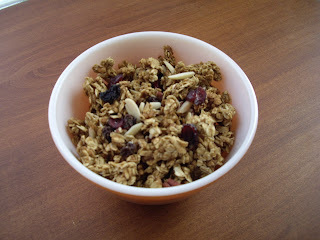 Unlike many granola recipes, you don't add any oil/butter. The liquid comes from pumpkin puree, applesauce, and maple syrup. This is a great way to use up all the bits and bobs of dried fruit and nuts that clutter up my kitchen. I used dried cherries, raisins, and cranberries for the fruit, plus a mixture of chopped pecans, slivered almonds, and sliced almonds. It smells delicious as it bakes. 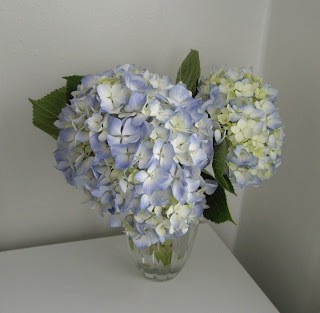 I'm packing up for yet another Midwest weekend getaway -- a trip to Minnesota to see my family. Have to fit it all in before the fall quarter insanity begins! I can't believe I waited so long to try this technique. Not only does it seem faster, it also seems easier on my hands and wrists. The pattern is Dublin Bay Socks, and the yarn is DIC Smooshy that I absolutely couldn't resist because of the colorway's name -- in vino veritas. 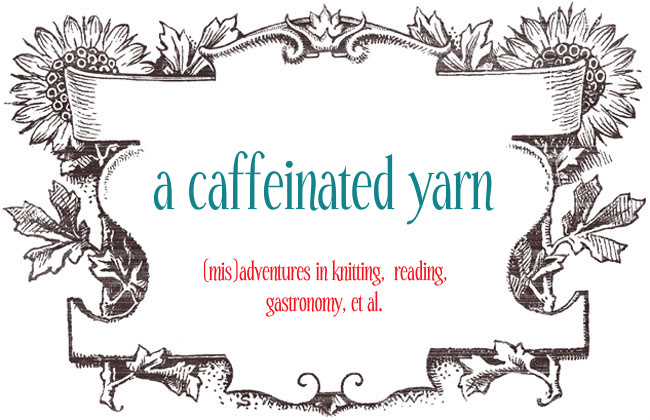 Yep, the combination of Latin and yarn is like a siren's song. Plus Dream in Color is dyed locally right here in Illinois. 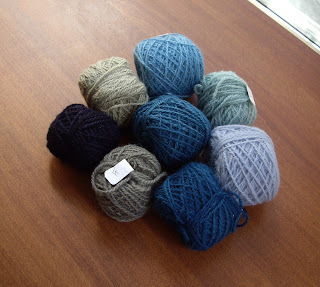 Inspired by Sarah's Knit Local project, I'm making an effort to support local yarn producers. There's even a Ravelry group. Kylie has been a little pissed that I've been buckling down on my diss. proposal before the new quarter starts. 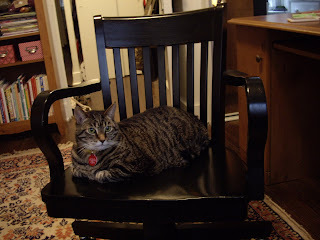 I've been taking up her valuable office chair space! BTW, the study/yarnville reorganization project went swimmingly. I'll post pics soon. 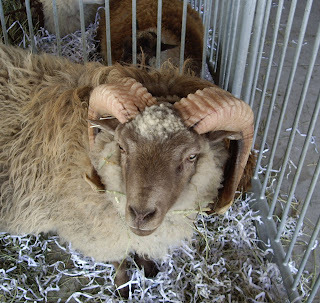 Now I just need to pack some car knitting, as I'm off to Wisconsin Sheep and Wool Festival this morning!